We finally found some missing parts of a technique, which in general is able to restore a completely broken spinal cord (medulla spinalis), though others seem to be short of making it possible as well. We also integrated two older technologies in a smart way. We also made an older technology more efficient by applying another older technology. As the only viable reaction to the many disastrous failures with rocket engine based launch systems, we from Style of Speed have taken the only right answer and stopped all related projects for civil space travel for an indefinite time, maybe forever. We never felt comfortable with the idea to take a winged rocket for space tourism. This is the 21st century and if competitors think they must follow the 7 decades old way with its incredible risks to get a business advantage, then we take the longer way to really push the limits and keep our customers alive. In relation with the doodles that showed the side view of the model F8 presented in the Further steps of the 14th of September 2014 we would like to show a part of the design model F-Estetico by Jung Han Lee, Jae Chan Ryu, and Hyun Kim Choong, which comes even closer to the final design of the air-intakes for the turbochargers and the rear fenders (see also the related Further steps of the 21st of November 2012, 11th and 13th of December 2013, and 12th, and 16th of September 2014). For a better prove we showed the related doodle of us once again. At this point, we would like to give the information once again that we showed only doodles, and neither common design sketches nor finally designs. By the way: Imagine the air-intake at the side with the straight line below and the curved line above, and maybe made a little shorter and shifted a little to the back, so that the lines correspond (more) with the original lines. The next time our little punk, who thought to be very clever when he took our concept for his design (bottom image), learns to refer- ence correctly. Or is this the next attempt by the marque Fiat→ Ferrari to steal our F8 concept or come up with a 458 GTO convers- ion, because it shows the air-intakes at the sides that the manu- facturer needs for its bi-turbo engine? In the latter case, we will give a strong answer if we see something at Ferrari that is related with our concept and once again is not referenced correctly. We have adapted the layered display with an reflective e-paper layer and an active (O)LED based display layer of our @Book and also added the layered (A)IMOD and (O)LED, e-paper and QLED, and (A)IMOD and QLED displays for our other mobile devices, like our Sm@rtWatches and Ontoscopes, and also for electronic visual displays, like computer monitors and televisions, in the following ways. The invention is a mobile computer system, that has at least one reflective apparatus for the optical signaling respectively present- ation of changeable informations (short reflective display) and at least one active apparatus for the optical signaling respectively presentation of changeable informations (short active display) with the image giving layer based on a diode, with the displays layered respectively stacked on each other, an energy source, a case, and a wristband respectively bracelet attached on its case. One of the active displays can be based on the Light-Emiiting Diode (LED). One of the active displays can be based on the laser diode. One of the active displays can be based on the Quantum dot based Light-Emiiting Diode (QLED). One of the reflective displays can be based on a so-called e-paper technology. One of the reflective displays can be based on a film made out of an optoelectronic phase-change material. One of the reflective displays can be based on an interferometric modulation. One of the displays can be a touch-sensitive display. One of the displays can have a substrate made out of a polymer/plastic. 1. A mobile computer system with an active display, like a wearable computer, specifically a smartwatch, does not need to show all informations on its display, which draws electric power all the time in this way. 2. Existing solutions do not use the most efficient display techno- logies all the time. For different informations a display with less dynamic, colour or other features is sufficient. By using different display technologies, which are layered/stacked on each other, for the related information the display layer with the lowest power consumption can be chosen to extend the battery runtime. As an example, the figures below show a variant of the mobile comp- uter system with layered/stacked display in different views. 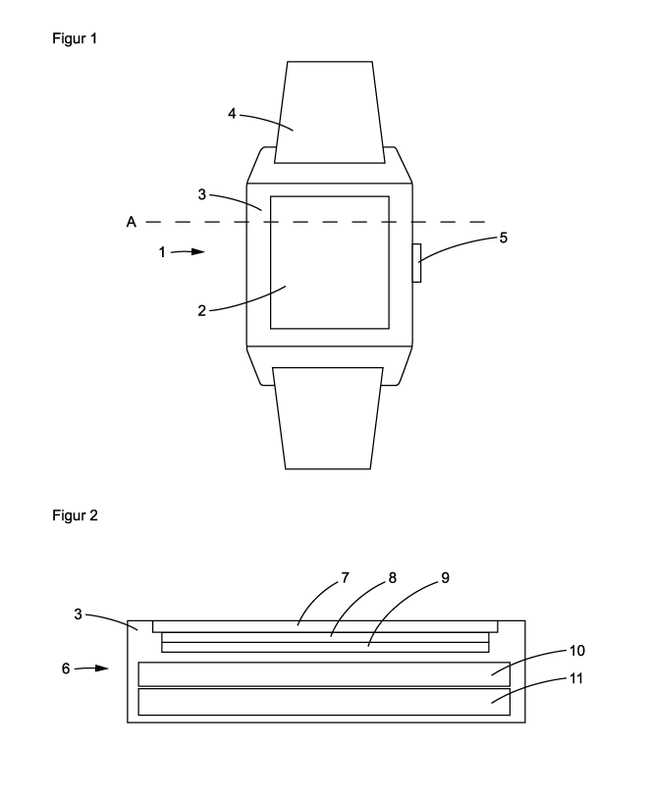 The figure 1 shows a mobile computer system (1) with layered/ stacked display (2), case (3), wristband (4) and operating button (5) as top view. The figure 2 shows the cut (A) through the mobile computer system (6) with case (3), protective glass of the layered/stacked display (7), transparent active display (8), reflective display (9), system board with processor, data storage and other components (10) and the energy source/power supply (11). The invention is a mobile computer system, that has at least one reflective apparatus for the optical signaling respectively present- ation of changeable informations (short reflective display) and at least one active apparatus for the optical signaling respectively presentation of changeable informations (short active display), with the displays layered respectively stacked on each other, a wireless cellular respectively mobile network module, an energy source, and a case. One of the active displays can be based on a Liquid Crystal (LC). 1. A mobile computer system with a wireless cellular respectively mobile network module, like a mobile/cell phone, specifically a smartphone, does not need to show all informations on its display, which draws electric power all the time in this way. For different informations a display with less dynamic, colour or other features is sufficient. By using different display technologies, which are layered/stacked on each other, for the related information the display layer with the lowest power consumption can be chosen to extend the battery runtime. For example, when the mobile phone is used for making telephone calls or reading a simple text document a reflective display is sufficient, while running a multimedia application needs an active display with a higher dynamic. As an example, the figures below show a variant of the mobile computer system with layered/stacked display in different views. 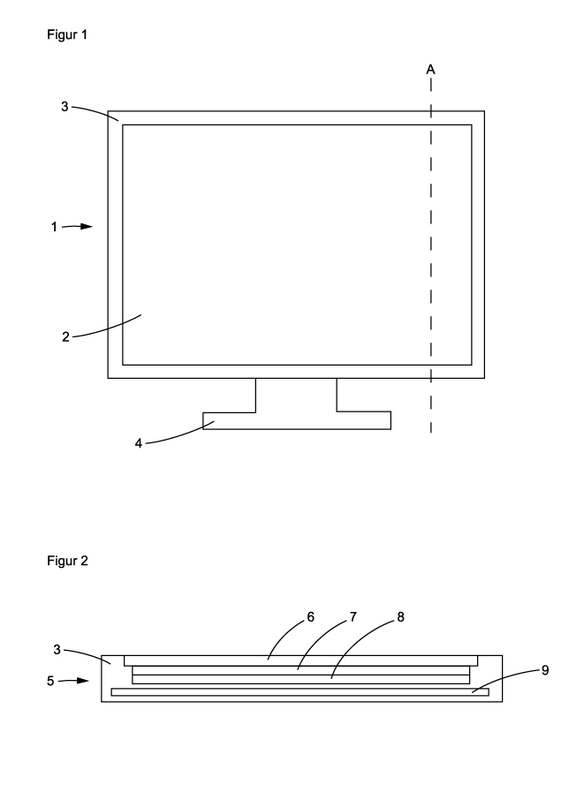 The figure 1 shows a mobile computer system (1) with layered/ stacked display (2), and case (3) as top view. The figure 2 shows the cut (A) through the mobile computer system (4) with case (3), protective glass of the layered/stacked display (5), active display (6), reflective display (7), system board with processor, data storage, wireless cellular/mobile network module and other components (8) and the energy source/power supply (9). The invention is a mobile computer system, that has at least one reflective apparatus for the optical signaling respectively present- ation of changeable informations (short reflective display) based on an interferometric modulator and at least one active apparatus for the optical signaling respectively presentation of changeable inform- ations (short active display) based on a Liquid Crystal (LC), with the displays layered respectively stacked on each other, an energy source, and a case. 1. A mobile computer system with an active display, like a wearable computer, specifically a smartwatch, a mobile/cell phone, specifically a smartphone, a tablet computer, a laptop, and so on, does not need to show all informations on its display, which draws electric power all the time in this way. 2. Existing solutions with a layered/stacked display consisting of at least one reflective display and at least one active display do not use colour display technologies all the time. The figure 2 shows the cut (A) through the mobile computer system (4) with case (3), protective glass of the layered/stacked display (5), transparent active Liquid Crystal (LC) display (6), reflective (Active) Interferometric MOdulator Display ((A)IMOD) (7), system board with processor, data storage and other components (8) and the energy source/power supply (9). The invention is an electronic visual display, that has at least one reflective apparatus for the optical signaling respectively present- ation of changeable informations (short reflective display) and at least one active apparatus for the optical signaling respectively presentation of changeable informations (short active display), with the displays layered respectively stacked on each other, and a case. An electronic visual display with case, as part of a computer monitor or television, does not need to show all informations on its display, which draws electric power all the time in this way. For different informations a display with less dynamic, colour or other features is sufficient. By using different display technologies, which are layered/stacked on each other, for the related information the display layer with the lowest power consumption can be chosen to reduce overall power consumption. As example, the figures below show a variant of the electronic, visual system with layered/stacked display in different views. 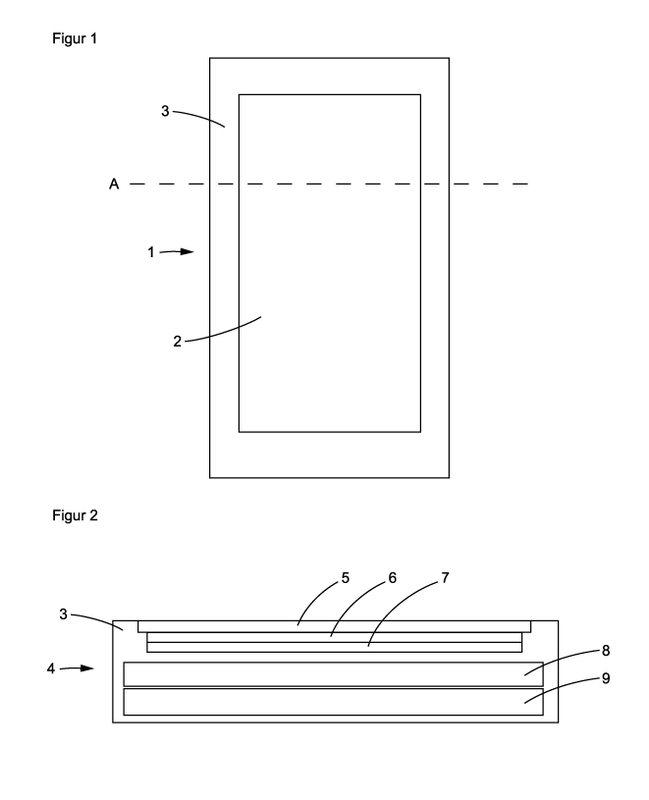 The figure 1 shows a electronic, visual (1) with layered/ stacked display (2), case (3), and stand (4) as top view. The figure 2 shows the cut (A) through the electronic, visual (5) with case (3), protective glass of the layered/stacked display (6), active display (7), reflective display (8), system board with control electronics (9). We are pleased to inform about the adaption of the layered (O)LED and e-paper display as well as the layered (O)LED and (A)IMOD, QLED and e-paper, and QLED and (A)IMOD displays for special Ontoscope models. We are pleased to inform about the adaption of the layered (O)LED and e-paper display as well as the layered (O)LED and (A)IMOD, QD and e-paper, and QD and (A)IMOD displays for special smartwatch models. "Talents lend, bad artists imitate, geniuses steel. We have optimized a technology further. Also, we developed a special variant of our first Very High Resolution Display (VHRD) mentioned in the Further steps of the 4th of Sept- ember 2014, that now has 8K Pixels Per Inch (PPI) and runs in the progressive respectively non-interlaced mode at 120 Hz for sure, and the 16K PPI that runs in interlaced mode. But this is not all and even not so expensive. As a further measure in relation with the latest crashes of a space launch system and an aerospace vehicle powered by rocket engines and their investigations, and also our Further steps of the 1st of November 2014, we have rethought and redesigned several compon- ents of our aerospace crafts and systems to make them even more safer as they already are and in this way much safer than they would ever be constructed by every other entity. The resulting changes and reworks comprise everything that is relat- ed with the handling of the propellant, but also with the structural elements of the vehicles. In the course of this, as a by-product so to say, we reworked the X-3*/LittleStar completely, which virtually resulted in a new aero- space vehicle with higher efficiency and flexibility that might become the next generation of the LittleStar or its replacement. Today, we are celebrating the 8. birthday of OntoLinux. The work is now focused on OntoLix (see the related message below and the OntoLix and OntoLinux Further steps of the 21st of October 2014). NixOS - The Purely Functional Linux Distribution. Today, the Christian Stroetmann GmbH is pleased to announce the official start of OntoLix, an Ontologic System based on the Unix operating system derivative Berkeley Software Distribution (BSD). to name just some few of the highlights. More software and the correct variants for their integration will be listed on the OntoLix website. With OntoLix we now have a foundational software stack that in many parts is comparable to the operating systems Darwin with its hybrid kernel X is Not Unix (XNU) based on the microkernel Mach 3.0 and L4/Darwin respectively Darbat with its parts based on an L4 microkernel. In contrast to such operating systems OntoLix features the capab- ility-based security also on the application level and not solely on the level of the operating system modules and in this way is flatter, faster, and more secure, reliable, flexible, extensible, and intelligent than anything else. In addition, we also continued our general work related with our highly integrated Ontologic System Architecture (OSA) with its many new features that will amaze the users once seen in action. OntoLix is the next step of its realization. In the retrospective, some time was lost by the change of some foundational software components on the one hand, but on the other hand much time was regained due to the partial restart on a clean sheet. We continued with the design of our high-end graphics card and our computer (see also the Original vs. Inspiration of the 14th of July 2014). Furthermore, we developed a new component with extreme perform- ance. In a subsequent step we developed some more new components and related devices with extreme performances. In general, these new components offer many possibilities, but hon- estly we do not know what to do with them with the only exception of some few applications. At least we are sure that the technologies are fascinating. One of these few applications is a data storage device with at least around 250 times higher density compared to a common Hard Disk Drive (HDD) of the same size. As a consequence and while we were already working in this field, we optimized another feature of the HDD significantly by at least 300% that in the next direct step let to several more optimizations of this kind of data store. from the webpage Links to Software, and now we have to analyse if and what of the related taxomonies, thesauri, and ontologies could be listed on the related webpage of our website Ontologics.info. Said this, the National Cancer Institute also lost our accreditation, like several other national institutes and companies of the U.S.A. before. We developed a technology further. We developed our Sm@rtWatch architecture further. For sure, we had a solution in mind for the lack of device drivers for BSD Unix operating system derivatives, but today we can confirm that every open source device driver of Linux is virtually available for BSD Unix as well now. After we solved this problem once and for all, we can now focus on the other many superiror features of OntoLix. Most potentially, we found out how to use basic features of the OntoL4 based hybrid kernel for accelerating our OntoBase compon- ent significantly. programming language Vala that translates to the programming language C.
We continued our work on a technology with excellent performances. We developed a Smartthing mentioned in the Further steps of the 29th of October 2013 and 2nd of November 2013 further by applying the technology behind the optimized component mentioned in the Further steps of the 8th of September 2014. In this way we could solve one of the two open problems mentioned in the Further steps of the 2nd of November 2013 in a different way than thought before and also optimized the efficiency of another feature as the one mentioned in the related Further steps of the 11th of November 2013 by 100%. Now that we have a concept and a working model we can focus on the realization and the optimization of the Smartthing. We also developed the technology mentioned in the Further steps of the 22nd of September 2014 further. We also would like to mention that already on the 29th of December 2013 we have combined an autostereoscopic display, which features a display controller and at least one optical sensor or sonic sensor respectively sensor for sound waves, and is controlled by using the captured sensor information, with an additional touchless sensor, that is an inertial sensor or inertial measurement unit, which is also used to control the display as well as an application. On the same day the protection started. Btw. : Now, it is no surprise anymore that Nintendo's New Nintendo 3DS features this technology as well besides our multi-layer autostereoscopic display with display controller and at least one touchless sensor (see the Further steps of the 18th of December 2013 and keep in mind that the relevant date is the 16th of December 2013). That is definitely not the way how business functions by looting others' portfolios of intellectual properties. The case of Seijiro Tomita vs. Nintendo will not repeat. Quite contrary, we are thinking about reporting its business attitude to the market regulators if we will not find license fee agreements. We developed a new solution in relation with an older technology. We also developed a component further in several different ways. Furthermore, we could add another way of realizing a technology, which makes even more solutions possible. In relation with the latter step, we thought about an older concept that is still quite revolutionary and, more important, now realizable. Before again some persons think to be clever and to have found a legal loophole based for example on the integration of the flexible batteries with ceramic-separated cells of our ultra devices and our related Flip-Flop technology with our Link Belt/Band Accumulator/ Battery. Now comes the little problem: We have protected an accu- mulator band/strap in general and not as a link belt/link band accumulator only, with battery cells in the variants that are based on lithium on the one hand and flexible/bendable on the other hand, as well as with a buckle or clasp. and that the accumulator cells are connected with each other in a movable/limber manner, so that the accumulator is a flexible band/ belt/strap. and that the accumulator has a buckle/clasp (corrected and clarified on 6th of December 2014)]. [that at least one accumulator cell is based on the chemical element lithium (corrected on the 29th of November 2014)]. [that at least one accumulator cell is stretchable (corrected on the 29th of November 2014)]. [that at least one accumulator cell is bendable (corrected on the 29th of November 2014)]. and that the single accumulator cells are links of the band/belt. and that the single accumulator cells are integrated into the links of the band/belt. [that at least one band/belt link is made of metal (clarified on the 29th of November 2014)]. that a single band/belt link is made of plastic. [that at least one band/belt link is made of plastic (clarified on the 29th of November 2014)]. and that the single accumulator cells are connected with each other by flexible wires. [and that at least two single accumulator cells are connected with each other by flexible wires (clarified on the 29th of November 2014)]. [that at least one accumulator cell is jacketed by leather (corrected on the 29th of November 2014)]. [that at least one accumulator cell is jacketed by plastic (corrected on the 29th of November 2014)]. [that at least one accumulator cell is jacketed by elastic polymer respectively rubber (corrected on the 2nd of December 2014)]. [that at least one accumulator cell is jacketed by woven fabrics (corrected on the 29th of November 2014)]. that at least one end of the accumulator belt/band is formed in such a way, that it can be mounted on the band lugs/attachments [resp- ectively horns] of a watch case [(clarified on the 29th of December 2014)]. that at least one end of the accumulator belt/band is formed in such a way, that it can be mounted on the [band lugs/attachments resp- ectively] horns of a watch case [(clarified on the 29th of December 2014)]. that at least one end of the accumulator belt/band is formed in such a way, that it can be mounted on a watch case after the approach of the so-called Leonardo-attachment. that at least one end of the accumulator belt/band is formed in such a way, that it can be mounted after a push-in, plug-in, or insert approach (added on the 6th of December 2014)]. that at least one end of the accumulator belt/band is formed in such a way, that it can be mounted on a watch case after a push-in, plug-in, or insert approach (added on 6th of December 2014)]. [and that the frame and the prong must not be connected with each other respectively must not be at the same end of the band/belt (clarified on the 3rd of December 2014)]. [e.g. type of butterfly, deployment, etc. (clarified on the 2nd of December 2014)]. that the accumulator belt/band has a quick release fastner, that is a click buckle or clip buckle respectively push-in buckle or insert buckle. that the accumulator belt/band has a hook and loop fastener [resp- ectively velcro fastner]. [that the accumulator has at least one photovoltaic cell (corrected on the 2nd of December 2014)]. that the accumulator has a contact-based connection to an external recharger device. that the accumulator has a wireless connection on the basis of induction to an external recharger device. The problem underlying the invention specified in claim 1 is to create an accumulator that can provide electric power to portable electrically powered devices; and thereby be worn on the body of a user. The accumulator can be used as a link belt/link band, specifically for digital watches and mini-computers, link necklaces, and waistbelts. Obviously, our claims comprise more than a wristwatch band. Also, drawings are not so important in total contrast to the claims. We would like to remind our demand to work with us only on a worldwide non-exclusive base or not at all in relation with such products. Thank you very much for marketing our other new product of iRaiment and making our business unit even more worth than it already was. We designed a new smartwatch model that might become a whole model series. Because J. Koons has busted himself once again we made a note about him and a general note on our one and only, original, pure Culture webpage. We developed a technology further, which becomes more and more amazing. As a side effect, we developed a new technology respectively we adapted an older technological concept for a different field of applications. As another side effect, we developed a new application based on the new technology mentioned before. We used the new solutions mentioned before to optimize another technology. Furthermore, we integrated the older technological concept and some of the new solutions mentioned before with the technology developed on the 14th of November 2014. Actually, we do not think that hightech could be more crazy. Said this, we are coming closer and closer to the point where our newest technologies and their applications cannot be understood anymore in the common sense, because they become more and more these ab- stract, complex, and highly developed Star Trek alien stuff. Also, we developed an integration of two technologies further. Very, very, very, ... fascinating. What else? Now seriously, this is really the next big thing. Our muscle car takes more and more shape. Forget the originals, because here comes the new one. We also worked on a special technology and could sketch some detail solutions, so that our dream can come true very soon, though we could already present a very well working prototype. We thought that it is time to show some initial images, that give an impression of the design direction of our muscle car Matchem. The images below show the design concept Bentley R-Type of Alexander Kotlyarevsky without marque emblems, which is somehow closely related with our upcoming pony car, the BTT (see also the Further steps of the 3rd of November 2012). There is no need to panic and to copy, as usual, because it is really somekind of a teaser for the fastback only.